QUOTE | “In Wolfenstein’s case, it’s pure coincidence that Nazis are marching in the streets of America this year. 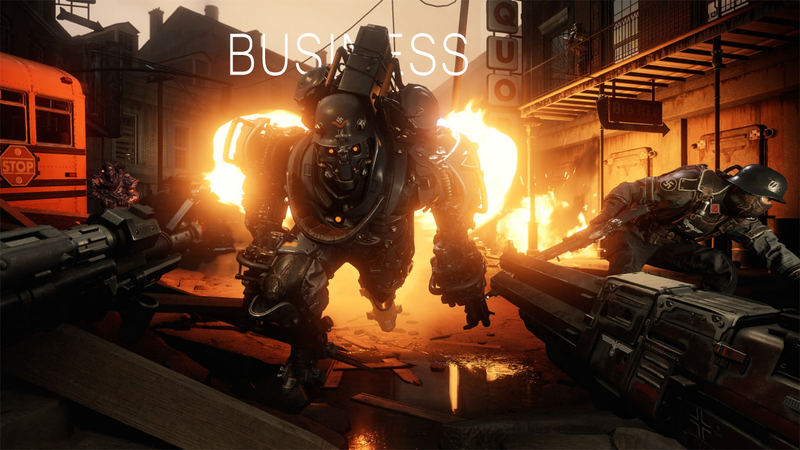 And it’s disturbing that the game can be considered a controversial political statement at all.” - Bethesda’s VP of PR and marketing Pete Hines says the company wasn’t trying to make a political game with Wolfenstein II: The New Colossus, but isn’t shying away from condemning Nazis, either. QUOTE | “Overall, the community is awesome to us. But there are some pretty mean people out there. All of our developers are free to post on these forums. Very few of us actually do because it’s extremely intimidating and/or time consuming.” - Overwatch director Jeff Kaplan says it sometimes feels like there’s no winning against toxic players in his game’s community. QUOTE | “I’d like to apologize on behalf of Riot to both Tyler1 and the community for this. We will be taking action internally to address this (although it would not be appropriate to go into specifics here).” - Riot senior writer Ryan Rigney apologizes to the permanently banned “most toxic player” Tyler 1 after a now-former Riot employee insulted him and speculated on his demise in the League of Legends community Discord chat. QUOTE | “For Epic to restrict or control developers’ creative expression would be as bizarre and overreaching as if Microsoft Word restricted what ideas writers were allowed to express. We decided very early on that we’d never do such a thing.” - Epic’s Tim Sweeney explains why the company has no plans to withhold Unreal Engine 3 changes made for Fortnite and PlayerUnknown’s Battlegrounds from other creators. QUOTE | “For the Immortals organization, winning is just one piece of a much more important and broader puzzle.” - Immortals CEO Noah Whinston explains why he’s thrown the esports group’s Counter-Strike team into disarray and risking its guaranteed spot in a major competition by firing one of his key players and indefinitely suspending two more. QUOTE | “It’s a generational wave that’s happening. For the first time, just over a year ago, ESPN actually lost subscribers; that’s never happened before. The Yankees, my hometown baseball team, are significantly below last year on ticket sales. Things are happening to traditional sports that nobody expected, and quicker than anybody in that business expected.” - Activision Blizzard esports head Mike Sepso says competitive gaming has an advantage in that it doesn’t need to transition from a TV-dominated business model to online, a problem traditional sports are currently grappling with. QUOTE | “Good UI is like telling a joke, Candland said. If you have to explain it, it’s probably not very good.” - Bungie user interface designer David Candland offers a rule of thumb for developers at the Game UX Summit in Toronto. QUOTE | “Shovel Knight, which was almost 3 years old when the Switch launched, sold more units out of the gate than any other platform.” - Yacht Club’s David D’Angelo explains how helpful it can be to be on a platform’s digital storefront at launch, when customer options are limited. QUOTE | “We wanted to try and put different sub-cultures in the game, but right now it’s kind of only one; it’s all half-naked dudes.” - Inbetweengames’ co-founder Isaac Ashdown explains how the studio’s first project, All Walls Must Fall, has settled into its depiction of Berlin’s gay nightclub scene. QUOTE | “This situation has completely destroyed everything we have been working for in the past 3 years and we are forced to give up game development at this point…” - A statement from Silicon Echo Studios, which recently had 173 games removed from Steam in a crackdown on developers spamming cloned games on the storefront. QUOTE | “I would like to continue operating Final Fantasy XIV for 10 years. That’s the clear image I have in mind. Now that we’ve passed our fourth year, we’re aiming for that 10-year mark.” - Final Fantasy XIV director Naoki Yoshida reflects on changing goals for the MMORPG that has recovered nicely from its original disappointing launch.